Courtesy of Michael Sivel, BHHS Fox & Roach-Chestnut Hill. 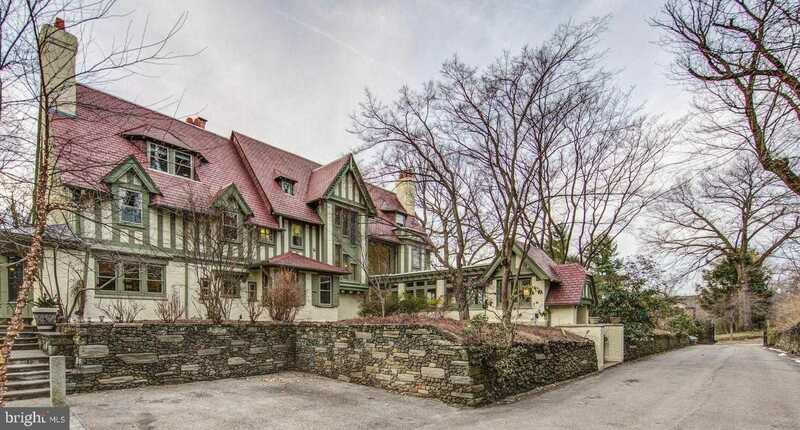 Welcome to Greystock Lodge, an architecturally significant circa 1908 Tudor home set back on one of the most desirable and private streets in Chestnut Hill. This exceptional home has been lovingly updated by the current owners, while still highlighting the gorgeous original details such as hand carved millwork, pocket doors, picture rails, deep windowsills and leaded glass windows. A long, covered walkway leads to the main foyer entrance hall with beamed ceiling, gorgeous original paneling, french doors to the terrace and the main gracious staircase with original carvings. To the right is the formal living room with gas stove, doors to the terrace and inviting window-seats framing views of the grounds. To the left is the dining room with fireplace, and sunlit renovated gourmet kitchen with leather-finish marble countertops, brushed metal subway tile backsplash, custom cabinetry, large center island with special The Galley sink, ample pantry space, breakfast area with banquet seating and skylights, rear staircase, and downstairs half bath. A gorgeous butler’s pantry is next to the kitchen, with an additional dishwasher, ice drawer and ice maker, glass-doored cabinets and built-in bentwood sink. Step down to the expansive great room, with vaulted, beamed ceiling, huge windows, and built-in bookcases flanking the fireplace. Underneath the main staircase is the temperature-controlled wine storage display, which adjoins a tucked away, private office with fireplace. The second floor master suite offers great light and views across the valley, with a huge master bath with soaking tub, walk-in steam shower, custom cabinetry, and doors to the bespoke, dual walk-in closets. A full hall bath with clawfoot tub, laundry room, sitting room with balcony and an additional bedroom suite with full bath and fireplace can be found on the second floor. The third floor features the beautiful screen panel from the 3-story organ that once lived at Greystock. Several hall closets and a massive cedar closet provide ample storage space. Two large bedrooms, one with lofted area, a full hall bath and sitting room complete this upper floor. A built-in BBQ grill with outdoor sink set into one of the multiple bluestone terraces provides a perfect space for warm weather entertaining. A garden shed offers extra storage space and there is also a 2-car garage. Conveniently located close to the shops and dining of Chestnut Hill, and just a few blocks from two train stations, making for an easy commute to Center City. Don’t miss this absolute gem!